Fuse is a common switch gear device which we see even at our homes. It is used to protect a device or circuit from over currents. For household purpose usage of HRC fuse is more economical than usage of circuit breakers. Let see a clear picture about what is fuse? , how a fuse works? What Is Meant By HRC Fuse? 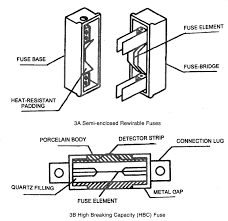 HRC fuse means high rupturing capacity fuse which is a modern type fuse. It interrupts current flow and protects from over current. 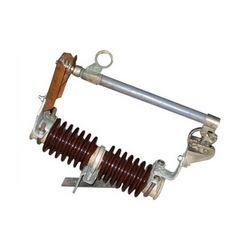 It is used to provide protection from short circuit damages in low voltages and medium level voltages. The body of HRC fuse is made of ceramic which is highly heat resistant. It has two end caps to this caps a silver current carrying element is welded. The internal space of fuse is filled with powder material such as plaster of paris, marble, chalk, cooling media etc. as shown in the following diagram. The above diagram shows the cross-sectional diagram of a HRC fuse. 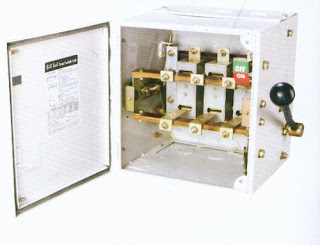 The fuse wire inside the HRC fuse conducts the short circuit current for a period of time safely. During this time if the fault is removed the fuse doesn't blow off. 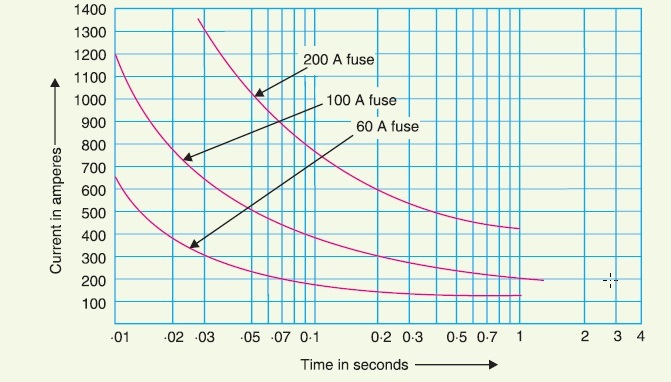 But if the fault is not removed the fuse will melt and isolates the circuit from the electrical supply as shown in the below figure. The inner portion of HRC fuse consists of cooling medium which helps to carry normal current by the fuse wire without heating. When over current flows then heat is produced in the current carrying fuse wire because of high I2Rf loss. This heat vaporizes the silver metal element and a chemical reaction takes place between this silver metal and filling powder which produces a high resistance substance. This high resistance substance helps in arc quenching. As discussed for normal current the fuse wire doesn't melt but when over current flows due to high I2Rf loss the fuse wire melts.So fuse wire melts faster for higher fault currents and takes more time to melt for lower fault currents. 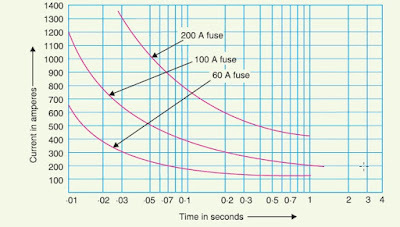 This gives the time-current characteristics of HRC fuse. This is shown in the following figure. 1.Semi- enclosed or rewireble type. 2.Totally enclosed or cartridge type. 3. Current limiting fuse link. Now let us see each of them in detail. 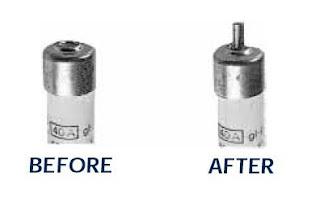 In this type of fuse the carrier of fuse can be pulled out and the melted fuse wire can be replaced with the new wire. Carrier has to be replaced in the fuse base. This type of fuse is used in our houses. Its diagram is shown below. In this type we have a fuse wire inside a totally closed container and it has metal contacts on either sides. This is further divided into two types. 1. Bolted type 2. D-type. The above diagram is cartridge type fuse. This fuse link brings the current to a value lower than a prospective value. After fault current flows,fuse-carrier drops out. Now there will be isolation between the terminals. This diagram is shown below. In this type of fuse the arc is quenched when produced arc produces heat which vaporizes the metal and chemical reaction is established between this vapors and powdered filling. This produces a high resistance substance which helps the produced arc to quench. This type of fuse consists of combination of a fuse and a mechanical device. 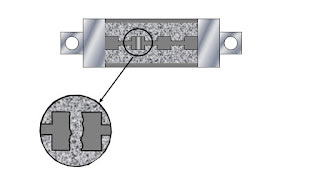 This fuse releases a striker after fuse operation with a certain displacement and pressure. The following figure shows diagram of striker fuse before and after fuse operation. This is a fuse which contains both switch and fuse. This is shown in following figure. In this post we have discussed about the operation, types and characteristics of HRC fuse. We at ElectricalEdition provide you quality articles,projects,news about electrical technology an dengineering. Subscribe to our posts via email.We will not spam your inbox.